My friend and I went on a recent walking trip through Philly. This was my favorite shot from the trip. 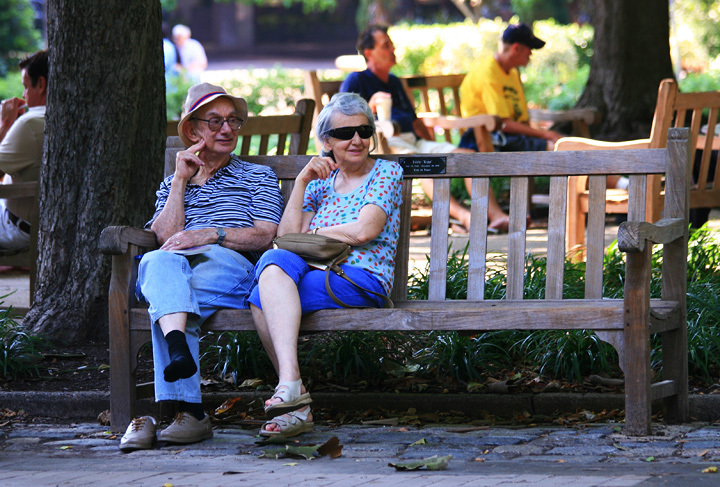 This couple sat together on a park bench and watched the people strolling by. They moved in perfect unison. Heads turned in the same directions.. hands made the identical motions through the air.. I am facinated by the hidden rhythms of the universe.. to see two people so closesly in tune with each other defines beauty. There are several out takes from the shoot of this couple in various positions.. perfectly aligned.. I love the one shoeless foot. Super find, and well timed. good luck. I think this might have been better as a B&W and cropped a bit on the left. Great capture, although the background makes it more like a snapshot. Consider cropping to use the tre trunk as a left hand frame and to remove the guy with the yellow shirt. These two look very amused. I wonder why the gentleman took his shoe off. I like this photo because the subjects seem like such characters. That's great. They've been together quite a while, I would imagine. Good find. I love that he has one shoe off! Someone is probably lucky to have them as grandparents. They look to be vibrant and interesting. I just love the shoe being off! And his furtive glance towards her. Thats awesome! I love how he has his shoe off... too cute. Proudly hosted by Sargasso Networks. Current Server Time: 04/23/2019 08:11:47 PM EDT.